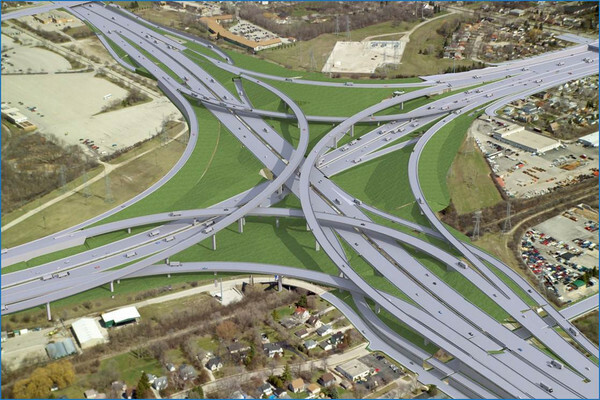 If there’s a highway expansion debate raging in your community right now, here’s a new item to add to the “con” column. The problem here is obvious: unless 100% of the new highway users are bypass traffic–none of them using the highway to get into the city itself–local roads have to deal with a huge influx of additional vehicles. Many of those vehicles aren’t bypass traffic, of course, so local streets (and their residents) are burdened with their presence and the congestion they bring. And while federal- or state-owned highways can sometimes afford to increase their capacity, local roads usually can’t. Besides being a poor choice from a return-on-investment and livability perspective, widening local streets to cope with the increase in vehicles is usually physically impossible–city centers are already built out and, thankfully, few people support tearing down homes and businesses just to expand local roads. Imagine this scenario: you live 20 miles outside the city and want to get downtown, so you take the freeway there. The highway part of your trip used to take 30 minutes, but thanks to the new lanes it now only takes you 20 minutes. The last mile of your trip has slowed since there’s a bit more local traffic, but it only increases from three minutes to five. All told, your trip time has decreased from 33 minutes to 25–great! Now imagine you live in the city, five miles from the city center. It used to take your bus 20 minutes to get downtown, but unfortunately as a city resident you don’t reap many benefits from the additional highway capacity. Instead, your trip is entirely on local roads, so all those extra cars coming into the city only slow you down. The trip that used to take you twenty minutes now takes thirty. The suburban visitor/commuter saved about ten minutes, and the city resident lost about ten, and all it cost was a few hundred millions dollars in construction and millions more in demolished buildings and businesses that are no longer producing revenue for the city. Money well spent, right? That’s a really good explanation of how highway widenings can quickly become a social equity problem. Elsewhere on the Network today: Bike Portland says folks in suburban Portland are already beginning to discuss “alternatives” to the Columbia River Crossing, a highway megaproject that met its demise last week. Mobilizing the Region reports that older adults in the New York metropolitan region are particularly vulnerable to pedestrian injury. And Transport Providence tells the story of a farm-supply business that replaced a gas station in the city and what they are doing to improve sustainable transportation.